We've had metallic paint, white paint, matte paint and vinyl wraps all come into vogue. The latest paint format that could take over as well-heeled drivers' finish of choice though, is flashing paint, reports Car Throttle. 'LumiLor', developed by US company Darkside Scientific, passes electric currents through a multi-layer coating to create a luminous effect. More than this, the pattern can be flashed on and off in individual sections for dazzling light shows. 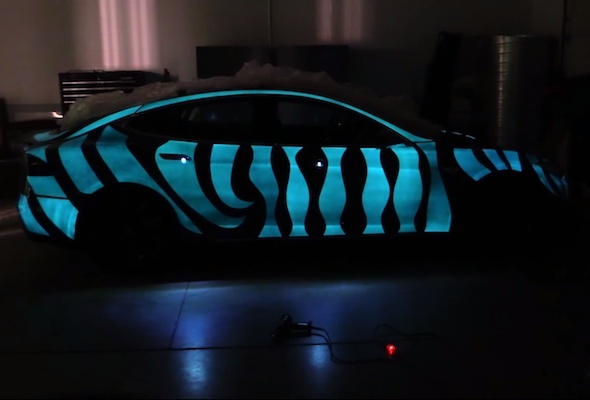 The coating appears to be invisible but the car comes alive when it gets dark thanks to a conductive surface, wire connections, primer and a coloured top coat. Surprisingly the effect also works in daylight.